Magimals TCG is 5% ready. On this page, we'll cover how to collect cards. First and foremost, there is no way to insure that you're being totally honest, but if you cheat, other players will soon figure out what you're doing and you will quickly find yourself without trading or sparring partners. It's in your best interest not to cheat. Follow the instructions on this website to the letter. You can find more cards on the main page of the magimals webiste. Check back regularly. They change. When you have a "trade" card, you can use this as a license to trade freely with any other trainer, either real or fictional. "Trade" cards are never discarded. You can keep yours even after you give it away. You can change your magimal using certain cards. For example, a maturation card lets you exchange many magimals for one in the next age group. 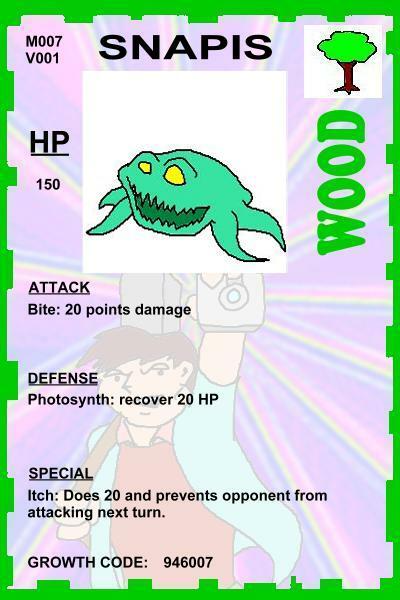 To use a maturation card, enter the following URL: http://www.ottercomics.us/magimals/tcg/ followed by the growth code of your magimal, then the code on the growth card, and finally, .jpg into your browser and hit enter. http://www.ottercomics.us/magimals/tcg/071003g81709.jpg"> This should get you the URL of a new card. Once you have the new card, you must discard the old one AND the maturation card. If you have a breeding card and the requisite number of adult magimals (usually two, but not always) then enter the growth code of the magimal followed by the code on the breeding card, following the formula above. Some magimals can only breed with another type of magimal. In that case, enter the code of the lower-numbered magimal first, then the other, followed by the breeding code. In this case, discard only the breeding card. DO NOT discard the parent cards. Some magimals can be crated only by fusing others. To fuse magimals, you must have a fusion card. Following the procedure outlined above, enter the numbers of all magimals to be fused, starting with the lowest and going to the highest, ending with the fusion code. You must discard both the fusion card and all of the magimal cards which were fused. Some magimals develop through the use of items. Follow the procedure above, using the item card as if it were a maturation card. If the item is consumable, discard both the old magimal card and the item card. If it is not consumable, discard only the old magimal card. If the magimal is one which changes when traded, use the code on your trade card as if it were a maturation card. RULES OF COMBAT There are three kinds of combat: sparring, hunting and warfare. In warfare, there are no restrictions. In sparring and hunting, special rules must be observed. To begin a sparring match, take up to eight magimal cards. This will be your team. You may have as many as sixteen item cards. Place four magimal cards face-up in front of you. These magimal cards are the ones IN PLAY. Only these magimals may make any move of any kind. Flip a coin to determine who goes first. Players get one turn for each magimal in the field. Once the first person makes a move, the second may make one move. Then the first, then the second and so on until all magimals have made moves. Once all magimals have made their moves, the round is over and the process starts again. 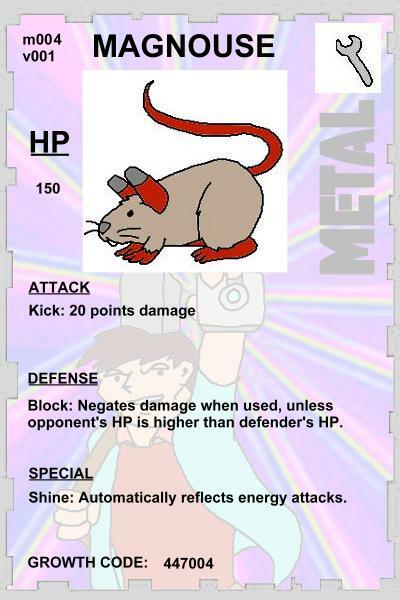 For its move, a magimal may use any of the abilities listed on its card. The trainer also has the following options. Each of these options take one turn and cause the magimal to forfeit their move for that round. 1) Magimal change- He may replace the magimal card with a card from his hand. 2) Item card- He may place an item card directly behind the magimal. That item may take effect immediately. 3) Pass- The magimal takes no action that round. 4) Surrender- The player may give up at any time. During sparring, trainers are not permitted to enter into combat. This rule may be overridden only by mutual consent. The object, of course, is to get every magimal on your opponent's team down to zero hit points. Once a magimal's hit points reach zero, it is removed from play and may not be used again during that battle. When a trainer has no more playable magimal cards, he loses and the opponent wins. You may wish to use a piece of scratch paper to keep track of your hit points. In a hunting match, the opponent places one or two cards into play on his side. These cards become "wild" magimals which may be captured and kept by the player. When hunting, a trainer card must be in play at all times. Only two magimals are allowed to assist in the hunt. Magimals and trainer have all of the options listed above (under "sparring") for their turns. The trainer also has the option of attempting a capture. To do so, he must use a digitizer cube. Once a cube card is played, it must be discarded and never used again, regardless whether the capture was sucessful. (More on cube cards at a later time) To use cube cards, you will need a 10-sided die. Follow the instructions on the card to determine whether capture was successful. If the trainer and his magimals are taken to 0 HP, they are defeated and the wild magimal goes free. (back to the opponent.) If the magimal being hunted goes down to 0 HP, it is considered mortally wounded. You can alert the rangers to come save it, but you can't have it. The magimal goes free. If any of the rules are circumvented, the magimal authority will confiscate your capture, so be careful. It is traditional to give your opponent a valuable item card as payment for the opportunity to catch their magimal. In warfare, there are no restrictions. You may play all eight of your magimal cards at the same time. You may directly attack the other trainer. You may revive your magimals as many times as you have revive cards. 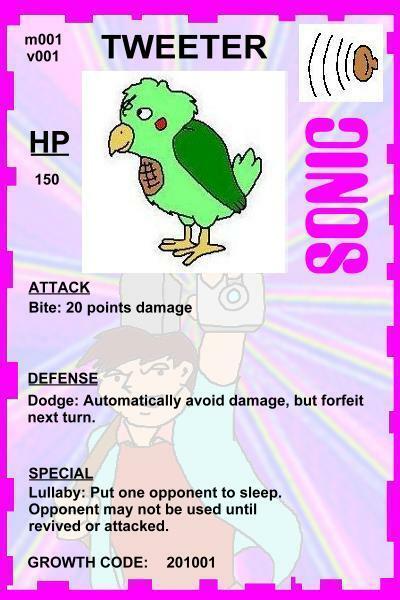 If a player chooses to use a trainer card (he may use up to nine) then battle ends upon his surrender or when all of his trainer cards reach 0 HP. If he is not using a trainer card, he is defeated when all of his magimals reach 0 HP. During warfare, either trainers or magimals may go into defense mode. To do this, the trainer or magimal takes up a position behind a magimal card. He can take no action while in defense mode, but cannot be attacked either. If the card in front of him reaches 0 HP, the magimal or trainer automatically comes out of defense mode. ELEMENTAL ADVANTAGE There are two ways to utilize elemental advantage. The first is for beginners, and the second for more advanced players. For beginners, all moves belonging to a certain magimal are assumed to be the same elemental type as is listed on the card. For example, if a water magimal is fighting a fire magimal and he uses the move "rot", it is counted as a water move even though the move "rot" is actually junk. Playing this way, all moves with elemental advantages do double damage. Likewise, a magimal with an advantage over his opponent will only take half damage from his attacks. 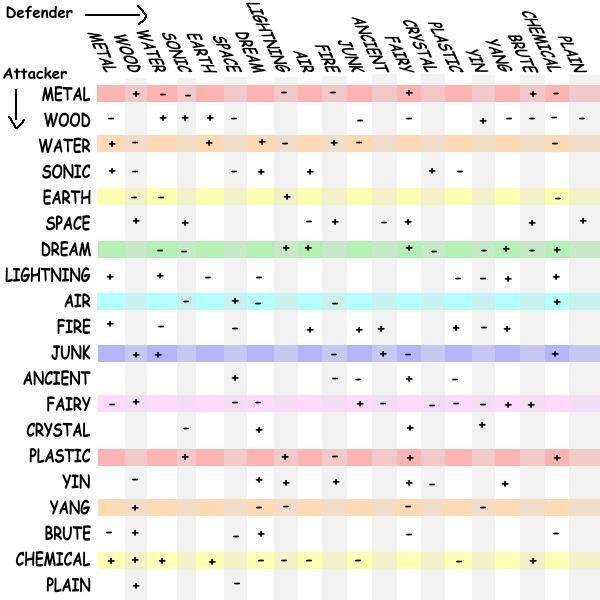 More advanced players may wish to consult the move chart to determine the elements of individual attacks. Those with an elemental advantage over the victim still do double damage. If the move is the same type as the magimal performing the attack, damage is doubled again. If the magimal is using an item which boosts the power of certain elemental attacks and the item has the same element as the user, the damage is doubled again. (not counting the original doubling effect of the item.) In this way, it is possible to get sixteen times the normal amount of power out of one attack. As with the simple version, magimals still receive only half damage from attacks with an elemental DISadvantage. Conditions Sometimes, an attack can leave a mark. Often, they interfere with a magimal's ability to function. Here are some of the possible conditions which a magimal may suffer. For the purpose of the card game, all of these conditions can be considered instantly cured when battle ends. Disorientation: A fancy name for confusion. This condition causes the magimal to attack his teammates until it is resolved. Each round, flip a coin. If the toss comes up heads, the disorientation passes. If it is tails, the disorientation continues and the magimal must attack his teammates. If he is alone, disorientation becomes moot, as his enemies are the only possible targets, and therefore ceases. This condition ceases the moment the magimal is removed from battle. Panic: This works the same as disorientation, except that the panicked magimal may also attack himself. Unlike disorientation, panic continues if the magimal is alone. Sleep: A sleeping magimal cannot attack or defend, but it can still be given items. a player may wait for a sleeping magimal to awaken naturally, using one coin toss each round. If the coin toss comes up heads, the magimal wakes up on his own and may take action that same round. The player may also wake the magimal up, but this will result in the loss of the turn. If the magimal receives any damage while sleeping, he automatically wakes up and may take action on his next turn. Poison: If a magimal is poisoned, he continues to take damage each time his turn comes around, according to the listing on the opponent's card. The lingering effects of poison do not vary with element type. If the poisoned magimal does not receive medical attention, the effects of the poison continue with the next battle. Slowness: When a magimal is slowed, his turn MUST come last in the round. If more than one magimal has been slowed, the one who has been slowed the most must go last. If they have been slowed the same amount, the player may choose which one goes first. If the slowness has been caused by sadness, the player may counteract the effect by using an item that cheers the magimal up. Hapiness: When a magimal is happy, he has the option of going first in the round. Deafness: a deafened magimal cannot follow orders and therefore can take no action. The trainer can either remove the deafened magimal or flip a coin to see if the deafness has worn off. If the coin toss is heads, it has worn off and the magimal may take action that same turn. Siezure: A siezed magimal may not be removed from the field. Weakness: certain moves weaken specific elemental types. Weaknesses like these continue for the duration of battle. Paralysis: A paralyzed magimal must make a coin flip and get heads in order to land an attack. Flipping heads does not result in the paralysis being cured. The paralysis remains even after the battle is over, until and unless the magimal is medicaly cured. Freezing: A frozen magimal may take no action until thawed. He must be thawed by the trainer or a medic, he cannot thaw on his own. Freezing lingers after battle until medical attantion is received. Hiding: Some moves, such as dive, result in the magimal being hidden. While the magimal is hidden, opponents must make a coin flip and get heads in order to hit that magimal. Reduced dexterity: Magimals with this promlem must flip a coin and get heads to land an attack. Effects of hiding and reduced dexterity are cumulative. Quicksand: Same as poison or fire, but lasts only until battle is over. Transformation: Varies with specific powers. Age: Aged magimals have all abilities cut in half. Reduced appearance: Since apearance does not actually come into play in the card game, this should be counted the same as reduced happiness.